Japanese Navy. Via Morison (1951). Hosogaya Boshiro was born in Nagano prefecture and graduated from the Japanese Naval Academy in 1908 and from the Naval Staff College in 1920. He commanded several battleships and cruisers between the wars and was promoted to vice admiral in 1939. At the outbreak of war, he was in command of Japan’s Fifth Fleet, a largely administrative command based at Ominato that was responsible for the naval defense of Karafuto, Hokkaido, and the Kuriles. It had only light naval forces assigned to it, including a few very light cruisers and a seaplane tender. 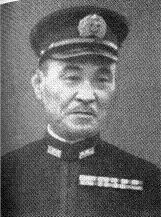 Hosogaya directed the invasion of Attu and Kiska during the Midway operation in mid-1942. On March 26, 1943, while protecting a convoy off the Komandorski Islands, at the extreme western end of the Aleutian Islands, Hosogaya’s squadron (which by then included heavy cruisers) battled a smaller American squadron The Americans under Charles McMorris fought with considerable skill and bravery, but were on the verge of being overwhelmed when Hosogaya abruptly broke off the action and fled. Hosogaya had mistaken shell splashes from colored dye shells for bomb splashes and thought he was under aerial attack. Considering the heavy overcast at the time, and the poor record of Allied land-based bombers against ships, the decision to break off was craven. Hosogaya was relieved of his command and retired from the Navy. He was recalled later in the war to serve as governor of the South Seas region.